Arizona energy map - yellow color points areas with high solar power potential. Click on picture for full size. California isn't the only state with the extremely favorable climate conditions for exploiting the solar energy as Arizona is heading in the same way but on a slightly smaller scale than California. With more than 300 days a year of sunshine, solar energy is more than logical future energy source for Arizona and certainly one worth mentioning. Since the natural gas prices as well as the oil prices are constantly growing these days, there is really a need for alternative energy sources and solar energy looks to be ideal choice for this warm state. There are many advantages using renewable energy sources such as solar energy: they're ecologically lot more acceptable than fossil fuels ( cleaner air, reduced emission of greenhouse gases), decreasing traditional dependence on fossil fuels and even economic development and competitiveness on global market. 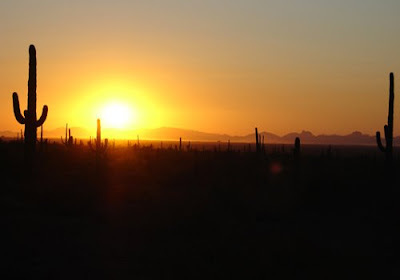 Arizona has already set goal to require 15 % of their energy from renewable energy sources by 2025 and large portion of this energy should be referring to solar energy having Arizona's favorable climate conditions in mind. Since Arizona has large desert areas with lots of sun it really offers the highest solar energy potential in the US, even higher than California. Arizona's dominant energy sources are currently coal (Arizona has lots of coal deposits) and natural gas but they're both ecologically unacceptable. Arizona also has the highest capacity nuclear power plant in the US (Palo Verde) and also has excellent source of hydro power in Colorado river. All these Arizona's advantages should really make Arizona more energy intensive and competitive, making Arizona's state economy much stronger in years to come. This particularly applies to solar energy as many experts predict Sun to be future number one energy source. With more than 300 days a year of sunshine Arizona has excellent solar power potential. This particularly applies to the warm Arizona desert. Click on picture for full size.